As a passionate home cook, it’s something of a moral imperative to never discard bacon drippings. This delicious by-product, which lasts a long time in your fridge, is a culinary secret weapon. It is the key to great cornbread, makes any vegetable you sauté in instantly elevated, and adding some into your fryer oil will make for a fried chicken that will change the color of your sky. But this fat is also surprisingly good for baking. Essentially smoked lard, you can add some to your pie crust for an apple pie with a little extra oomph. A bit in your biscuits will make your breakfast brighter. And it can take a fairly pedestrian cookie, your basic shortbread, totally next-level. This crispy cookie, with its little pops of salt and meat and heat, is equally at home on your cheese board as it is on your dessert plate. Slightly less sweet than traditional all-butter shortbread, with the addition of ground white pepper to balance the salt, plus chopped crispy bacon bits threaded through, it makes for a sweet cracker that cries out for a soft creamy cheese like goat cheese or brie or Boursin. But it also hits that salt-sweet vibe that makes chocolate covered pretzels and salted caramel so delicious, and can stand up to a dunk in dark chocolate or a maple glaze. It is a perfect pairing for ice cream, especially vanilla, caramel, or coffee. And if you want to win this year’s holiday cookie swap, sandwich them with cajeta or a bittersweet chocolate ganache. Whether you have these at your next cocktail party in the cracker basket or with your afternoon tea, they are one more delicious reason to start saving that bacon fat. This recipe calls for six tablespoons of bacon fat and presumes that you are saving that fat already and have it available. It is approximately what will render from a pound of bacon. If you don’t have bacon fat on hand, cook a full pound of bacon to get the fat. You’ll only need a dozen slices of bacon for the rest of the recipe, but there are worse things than leftover bacon. 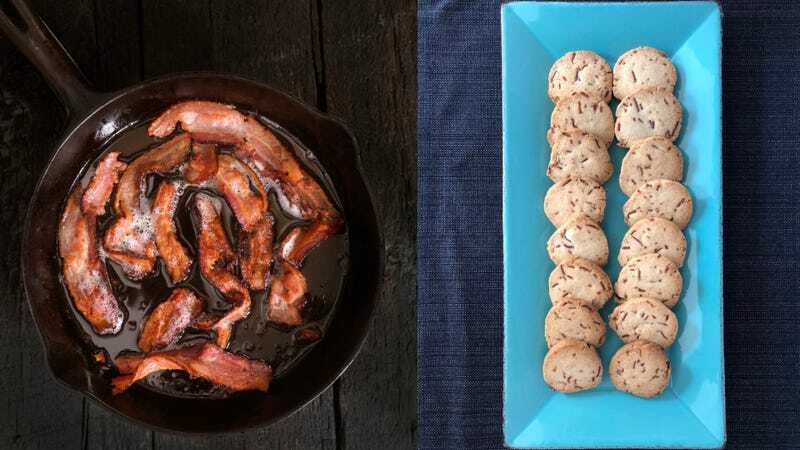 If you have plenty of bacon fat in your larder, you can feel free to use pre-cooked bacon or about a cup of bacon bits for the bacon in the cookies if you don’t want to cook fresh. In a stand mixer with a paddle attachment (or in a large mixing bowl with a hand-held electric mixer) cream the butter, bacon fat, and sugar until light and fluffy. Whisk the dry ingredients together in a separate bowl, then add to the mixing bowl and beat at low speed until barely mixed; there will still be some flour visible. Add the bacon pieces and continue mixing on low speed until just combined. Pre-heat your oven to 375 degrees Fahrenheit and line your baking sheets with parchment paper. If you prefer a neat and precise shortbread, roll the dough between two sheets of parchment to approx. 1/2-inch thick and cut to your desired shape and size. You can also roll into a log shape and chill for at least two hours, and then slice off round cookies. For a more rustic cookie, scoop the dough onto your sheet pan with the cookie scoop size you prefer, and press down gently with three fingers, pressing in around the sides as well, until you get a cookie about a half-inch thick. Keep cookies one-and-a-half inches apart on the baking sheet (they don’t spread too much). Bake 12-18 minutes depending on the size of your cookies, until lightly golden brown on the edges. Cool on the pans on a wire rack for 15 minutes. They will last up to two weeks in an airtight container. These are great as a cookie dipped in chocolate, or drizzled with a glaze made of maple syrup and confectioner’s sugar, or as a cracker with soft creamy cheeses. You can also sandwich them with ganache or caramel, and they hold up to heat, so feel free to infuse those fillings with chili peppers.